Manta is a revolution in hair care. With a user focused design, it offers both individuals and haircare professionals a more natural, less damaging approach to grooming. In a format that is instantly recognisable as a hair brush, the bristles can be manipulated so as to fit perfectly to the contours of the head. Together with innovative design and material science, Manta delivers a tactile and responsive brushing experience without the risk of breakage. Perfect for happy, healthy hair. 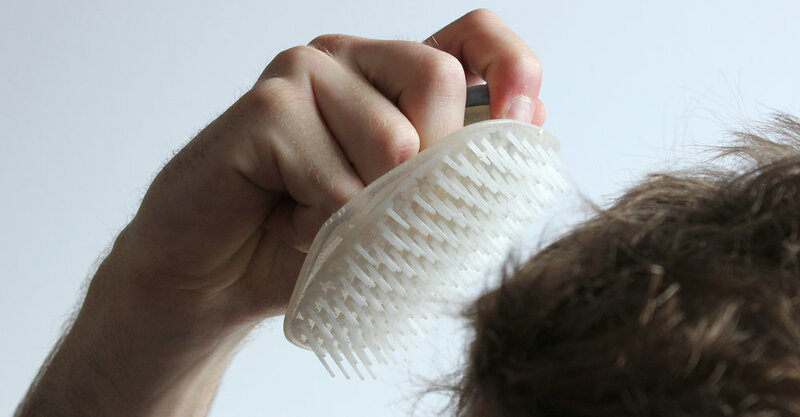 Manta is unlike standard hair brushes with its distinctive ability to mould to the shape of the user’s head. This meant we had to design a form that invited users to rethink how they use haircare products. Rituals such as hair brushing and grooming, where self-expression is so important, deserved a product that embodies a premium look, feel and experience. From its soft-touch body to the metal cap, Manta delivers a sense of indulgence that enables users to look their best. Heads come in all shapes and sizes and most hair brushes only ever scrape the surface, often causing breakage and hair loss in the process. By contrast, with its palm grip and flexing body that deforms to the shape of the scalp, Manta has been designed for brushing to the deepest level without placing undue pressure on the hair. With Manta being such an innovative design it meant that we had to rethink the standard materials and manufacturing processes traditionally used in hair brush design. With a combination of hard and soft materials together with a flexing body, we needed to source a new technique. Unable to find anything to meet our manufacturing requirements, we decided to source it ourselves. Through a series of prototypes, tooling tests and validation models carried out in-house, we were able to confidently source a suitable manufacturing partner. With close liaison and regular visits, we delivered a workable solution for Manta that then went into production. Manta continues to have great success and is available through a host of retailers. To discover how it can help you achieve stronger, healthier hair hit the links below.